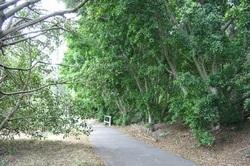 A cycle path runs through the site. This is a small site consisting of the land between Hawthorne Canal and the shared cycleway and footpath that runs from Parramatta Rd to Marion St. 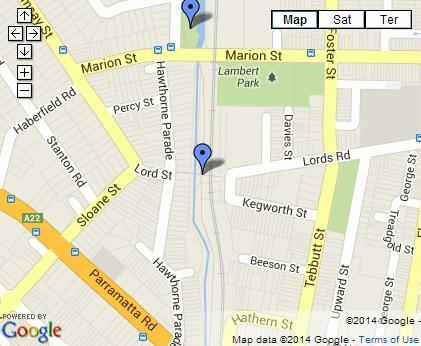 The site, which is about 50m x 10m, is on land owned by RailCorp and Sydney Water, and was established about 2001. Most of the work on this site has been to control weeds, with only a limited range of local-provenance species planted so far. A feature of this site is a mural on pedestrian subway depicting children from Kegworth Public School conducting Streamwatch testing. IWEG no longer maintains this site. About 12 local-provenance species have been planted there since 2001, and it is now visited by a surprising diversity of birds, including the Sacred Kingfisher (Todiramphus sanctus), Brown Goshawk (Accipiter fasciatus) and Superb Blue Wren (Malurus cynaneus). The Eastern Water Skink (Eulamprus quoyii) can also be seen perched in weep holes in the brick-lined drainage channel. Enter via the shared cycleway and footpath from Parramatta Rd from the south, Lords St, Haberfield from the west, and Lords Rd, Leichhardt, from the east.